You may know as a reader that my down fall in life is junk food. Usually the more unhealthy it is the more I like it! So naturally when I was given a chance recently to review a book that could help make my evil habits a little more healthy I was excited. 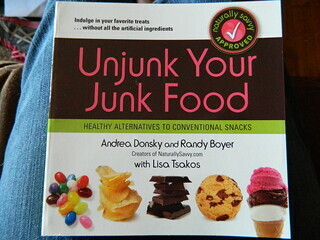 Unjunk Your Junk Food is a book about how to chose healthy alternatives to your conventional snack foods. Written by the creators of NaturallySavvy.com (a site you have likely heard about) along with Lisa Tsakos this books takes a dive into the ingredients that are actually inside some of your favorite foods. When the UPS man brought this book to my door I opened it right away and started to take a peak inside. It starts off with some of the basics on nutrition like ingredients and making label reading easier with a list of key terms and what they REALLY mean. 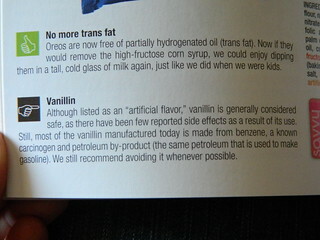 I was actually startled by some the these ingredients that I suppose I had never really thought about before making me really not want to eat anything that has been processed. 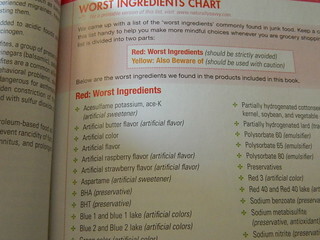 The book then goes into your favorite junk food categories. It has many name brand and store brand products listed with a full color picture. I love that not only does it just say that it is bad but it gives you the reasons as well! Then on the next page there is the healthy alternative, and again it doesn't just say this is better eat it eat it! It gives your the reason that this is a healthier selection. Most of the healthy brands are brands I have heard of and I think some actually surprised me like picking my Breyer's ice cream over Blue Bunny removing gluten, fat, calories and TONS OF SODIUM! If you can't find that brand in a store near you most also have a couple honorable mention products that you can substitute and still being taking that healthy step forward. If like me you are becoming increasingly worried about the things put into our food, or if you just want to know how you can make your life a little bit healthier I highly recommend this book. You can find it for sale on Amazon, Barnes & Noble, Walmart and of course on the Naturally Savvy Website. This looks like an interesting book. Nice that they made a book like this cause I am sure there is a lot in it that most people do not know about.